If you look at the left column above, you see that each post is by a “different” commenter with an 8 character name and 7 character outlook.com e-mail address. A disproportionate (all?) 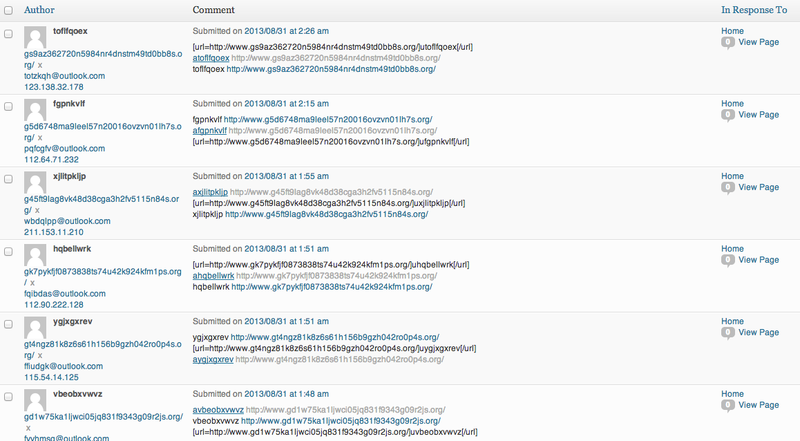 of my spam over the last several days or weeks has followed this pattern. Of the first 5 IP addresses shown in the image above, geoiptool.com shows that 4 of the IP addresses correspond to hosts in China (Xian, Shanghai, Guangzhou, and Zhengzhou), and one corresponds to a host from Columbus, Ohio. Is this just a really crappily written bot that hardly attempts to disguise itself and has been particularly active lately? Why only use outlook.com addresses? I would be interested to know if anyone else is encountering this (or these) bot(s), or has any additional information about what I’m seeing.